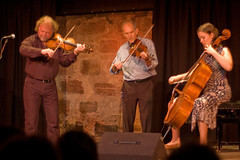 I'm still buzzing after an amazing concert at the Woodend Barn in Banchory. A concert with the very best of fiddlers and dancers from Scotland and beyond, featuring Alasdair Fraser and Natalie Haas (Scotland and USA), with Bragod (Wales), Boreas (Norway and Scottish Borders), Göran Premburg, Pernilla Stendahl, Gill Redmond, Mats Nilsson and Ingegerd Sigfridsson (Sweden and England), Caoimhín Ó Raghallaigh (Ireland), Bruce Molsky and Nic Gareiss (USA), the Aberdeen and Banchory Fiddlers (Scotland). It was 100% talent - none of your divas, charlatans or hacks of today. Well done NAFco for organising such a wonderful night - all for £10 too! I wanted to share with you what I did to take these shots. I'm not experienced in taking concert shots at all and didn't want to use a flash which I think is really off putting for the performers. I also didn't want lug the heavy D300 with the 24-70mm lens so took the D50 with the great 50mm f1.8 lens. I knew I didn't want the shutter speed slower than 1/60 so set the camera to shutter priority at that. I then set up auto ISO in the menu so that the camera controlled not only the aperture (which stayed pretty much at f1.8 anyway) but the ISO as well. What is interesting is the ISO values that appear. This one for example is 560 ISO. Interesting eh?